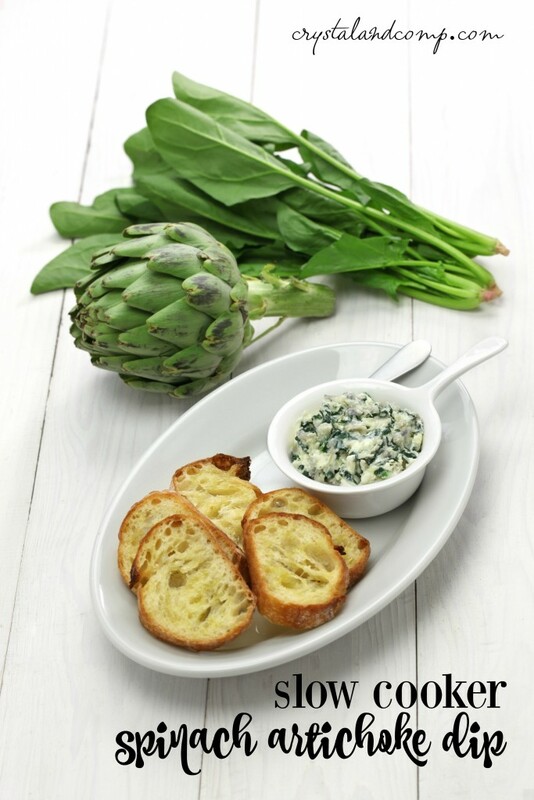 This is the perfect appetizer for your family get together. And the best news is, it comes together perfectly in the slow cooker! There is a crockpot website that I frequent at least once a week. The site is called Year of Slow Cooking. Stephanie completed a challenge in 2008 where she cooked in her crockpot every single day for a year. 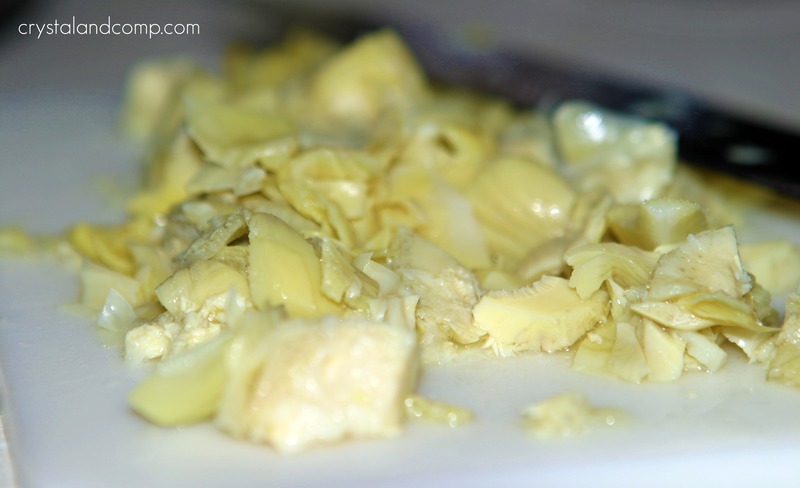 There are over 365 amazing recipes on this site, as she continues to add recipes as time goes on. 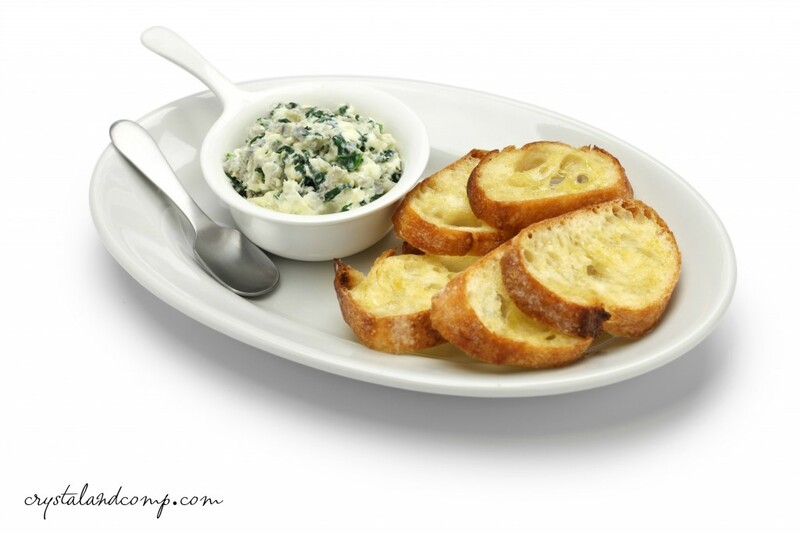 Her Spinach and Artichoke Dip is super yummy. 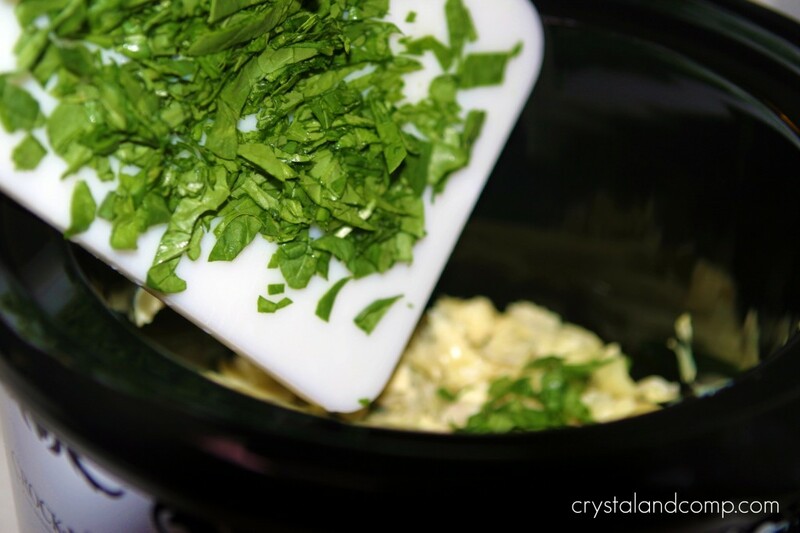 I made it this weekend and shared it at the craft fair I attended where I shared easy recipe ideas with busy moms and reminded them how the crockpot really is a huge time saver and a trusted cooking tool in my home. The response to this recipe was overwhelming fantastic and everyone who tasted it wanted to make sure they could find it on my site. 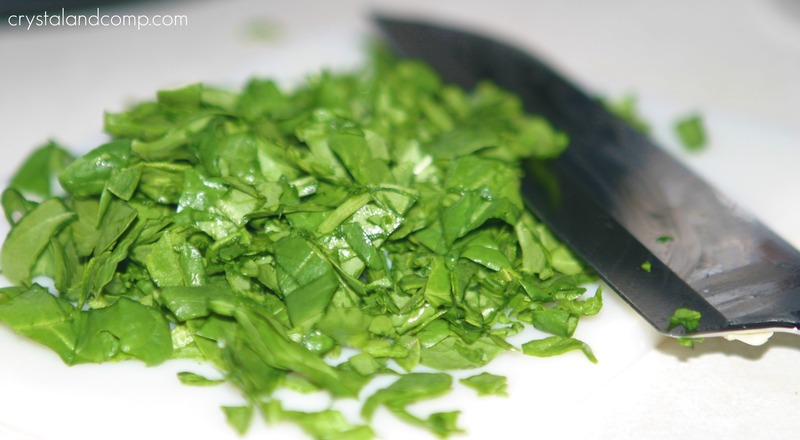 Stephanie includes jalapeno in her recipe, but I opted not to add them since children would be eating this. Add it to the crockpot. 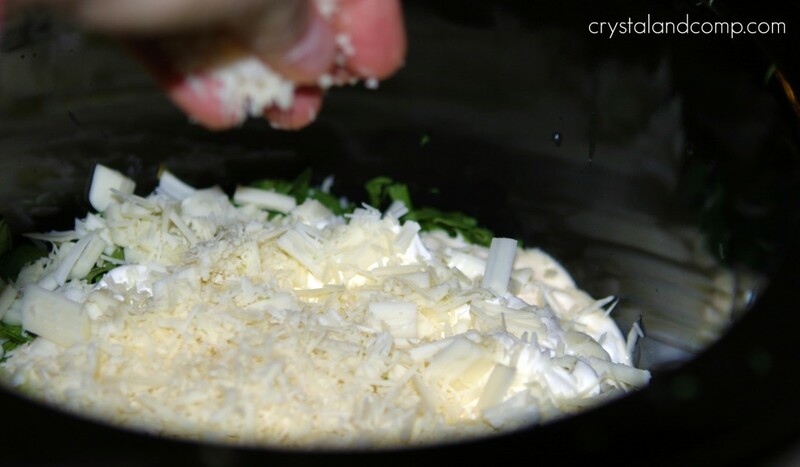 Add the mayo (or cream cheese). 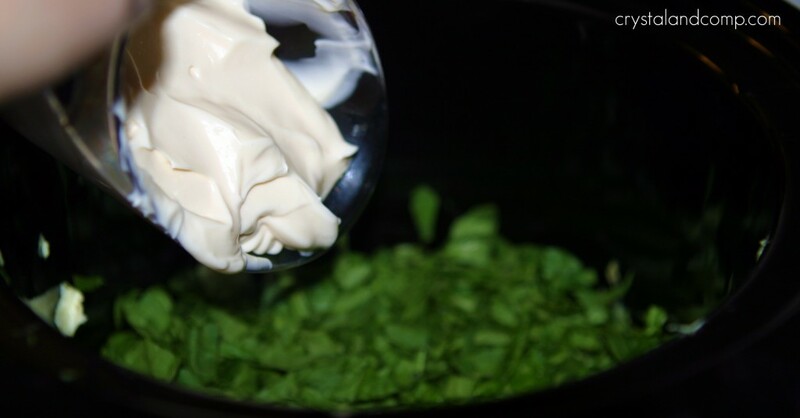 I like to smear the two creams to ensure they cover the spinach well. I go ahead and add all of both cheese. Stephanie’s recipe is a little different. Pop the lid on it. Cook on high for 1 hour or on low for 2-3 hours. I like to serve with tortilla chips or bread. This is perfect for a potluck, family get-togethers, holiday events, or a fun game night. I go ahead and add all of both cheese. Stephanie's recipe is a little different. I like to serve with tortilla chips. I saw this in my rss feed this morning and I was so hoping you would link it up. Fantastic idea to make this in the slow cooker. Yummy. I love spinach dip. I am going to have to make this. Nothing is better than a crock pot. We would love it if you could link this up to our linky party going on right now. this would be a perfect dip for thanksgiving! Looks delicious! And perfect for a party I’m hosting in a couple of weeks. Thanks! Sounds really good! What do you think the difference in taste would be if you used cream cheese? I think it would probably be a little richer and heavier in taste. Thank you for sharing this. I am so glad I found it. I am going to make this on Sunday when I host my family for Christmas. I’d love it if you came over and linked to my Must Try Monday. This sounds so yummy! I love artichoke dip and I love my crock-pot. Makes everything so easy 🙂 I would suggest, if you want a little bit of spice but something still that kids might like would be a can of diced green chiles. That’s always what mine seems to be missing in comparison to what we get when we order it at chain-restaurants. I’m also not a fan of jalapenos in particular-maybe to much vinegar-hot taste for me but I think the chiles would do nicely. Great post! 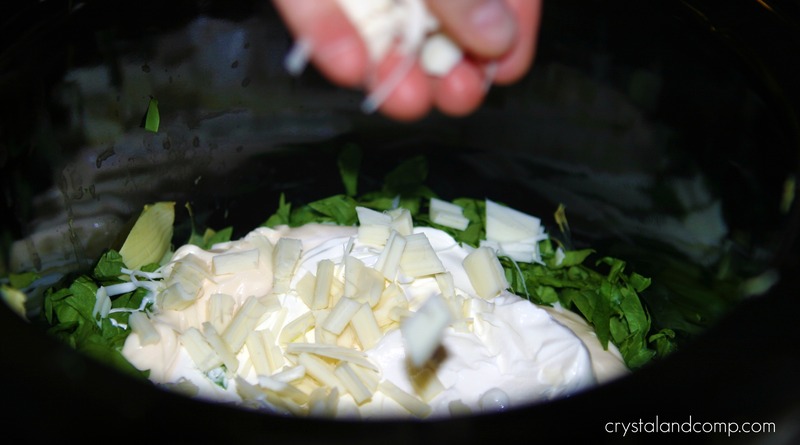 Do you use a standard size crockpot (like for dinner recipe size) or a small crock pot? I’m wondering if my regular big crockpot would be too big and the dip would look skimpy in it??? Thanks! I used my 4 qt round crock for this one. For one thing have your questions written out before hand. They do not perform any kind of standard stage tricks. If you are able to tune into pure spirit energy you will find it easier to manifest and to get what you want in life. Hi, I was just wondering how many this feeds? I’m throwing a party for my husband and want to make enough for everyone to enjoy! Becky- there is enough to feed nice size appetizer plates to 6-8 adults using one batch. Really it depends on how much each person eats, obviously. Yummmmmmm! That looks scrumptious! I usually serve my spin dip with pita chips, but that bread looks amazing. I’m doing that next time! 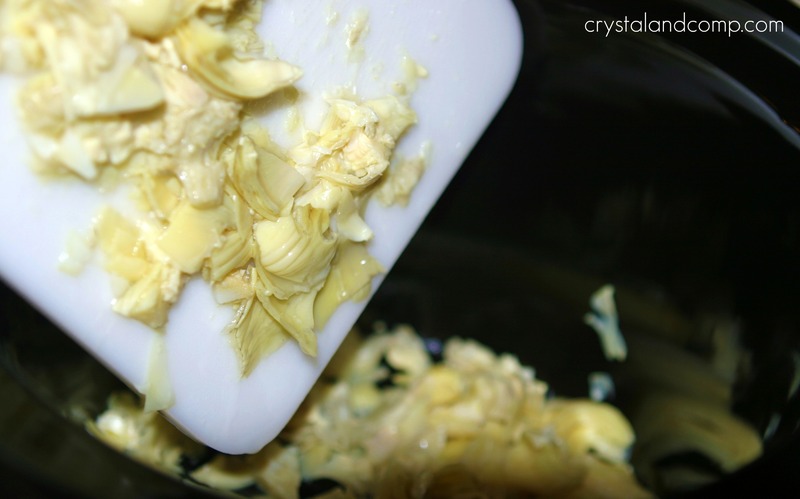 Thank you so much for sharing this recipe, Crystal. It is my kind of food! BTW I have selected this post as my Editor’s Pick Feature from the blog hop – it will be featured on Wonderful Wednesday Blog Hop this week. 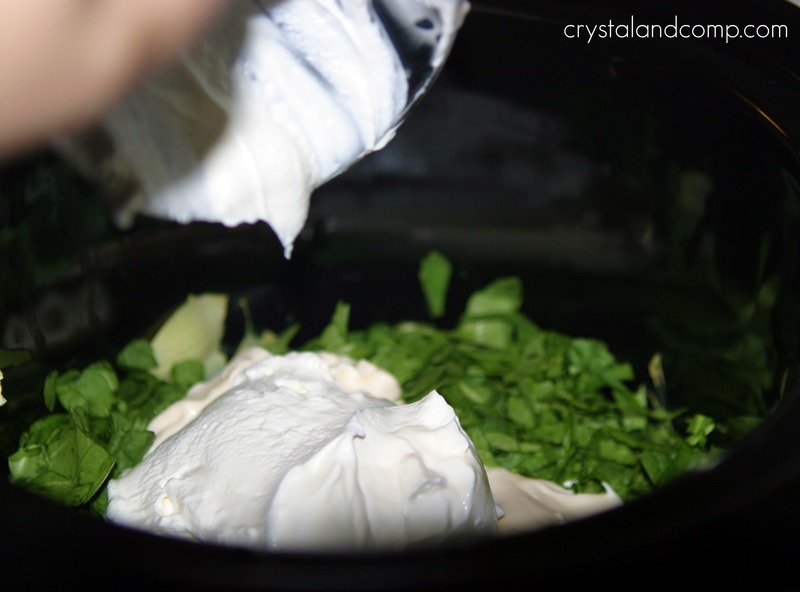 Oh my favorite dip- and this looks so easy! I think this would be perfect in my baby crockpot~ Thanks for bringing this by Throwback Thursday and Happy New Year~ I’ll be pinning this to our Throwback Thursday board.